Conjunctivitis - body, contagious, causes, How Do People Get Conjunctivitis? Conjunctivitis is an inflammation of the conjunctiva (kon-junk-TY-va), which is the thin membrane that lines the inside of the eyelids and covers the sclera, or white surface of the eye. Conjunctivitis is often called pinkeye. How Do People Get Conjunctivitis? Conjunctivitis is a common disorder in the United States, affecting one in every 50 people each year. Conjunctivitis has many different causes, including infections and allergies. This form of conjunctivitis is most often called pinkeye. It is contagious * , often the result of infection from bacteria, such as Haemophilus influenzae (he-MOF-i-lus in-floo-ENZ-eye), or viruses, such as adenovirus (AD-e-no-vi-rus), which can cause the common cold. This is the kind of conjunctivitis that often spreads rapidly in schools during the spring or fall. Neonatal * (nee-o-NAY-tal) conjunctivitis occurs when mothers with gonorrheal or chlamydial infections transmit them to their babies during childbirth. This form of conjunctivitis is also called neonatal ophthalmia (off-THAL-mee-a) and is treated with antibiotics. Allergies and irritant substances can also cause conjunctivitis. This type of conjunctivitis is not contagious and is more common in adults. Irritants and allergens * may include cosmetics (including mascara), pollen, air pollutants, smoke, dust, plant poisons, and animal danders from household pets. 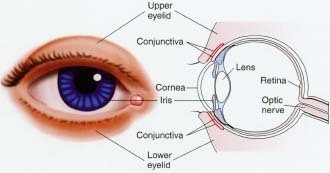 The characteristic sign of conjunctivitis is a redness or pink color in the white of the eye and lining of the eyelids. Sometimes the eyelids are also swollen. A watery discharge or pus may sometimes be seen coming out between the eyelids. Sometimes the lids are temporarily stuck together upon wakening in the morning. The eyes often feel itchy, but vision usually is not affected. Do People with Conjunctivitis Need to See a Doctor? People who suspect they have conjunctivitis should consult with a family doctor or an ophthalmologist * . By examining a person's eyes, a doctor can tell whether redness and irritation are caused by conjunctivitis or by something else. If the diagnosis is conjunctivitis, and the infectious type is suspected, the physician may take a small swab sample from the inside of the eyelids. When tested in the laboratory, such samples can be used to determine the type of organism causing the infection. This will be important for treatment, especially if bacteria are found to be the cause. * neonatal refers to newborn. * allergens are substances that provoke a response by the body's immune system or cause a hypersensitive reaction. In conjunctivitis, the membrane that lines the eyelids and covers the eye becomes inflamed and swollen. antibiotics. Or, the doctor may prescribe other medications, such as antihistamines (ant-e-HISS-ta-meens), to treat conjunctivitis caused by allergies. Other helpful treatments include using warm water to wash away discharge around the eyes, and applying anti-inflammatory ointments or eyedrops inside the eyelids. People with the infectious type of conjunctivitis, which is contagious and thus can be spread, should wash their hands often. They also should use their own separate washcloths and towels rather than sharing with others. In addition, it is important that they avoid rubbing the eye affected, because this may spread the condition to the other eye. Cassel, Gary H., M.D., Michael D. Billig, O.D., and Harry G. Randall, M.D. The Eye Book: A Complete Guide to Eye Disorders and Health. Baltimore: Johns Hopkins University Press, 1998. A good book that is easy to read. It has a chapter on conjunctivitis and contains more information about other eye conditions. Collins, James F. Your Eyes: An Owner's Guide. Englewood Cliffs, NJ: Prentice Hall, 1995. A useful nontechnical book on the subject. The U.S. National Eye Institute posts a fact sheet about the cornea, corneal diseases, and conjunctivitis at its website.